Located in Arcadia shopping centre just below the Union buildings. Offering 139 rooms, restaurant, bar and guest lobby bar adjoining the open terrace. 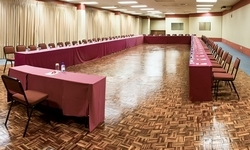 Conference facilities to accommodate from 10-250 delegates in eight different venues including our recently added Marigold Room. Friendly and caring service at unbeatable prices. Easily accessible from O.R. Tambo International Airport and major freeways.